Brownies- Prepare a batch of brownies using your favorite box mix (for a 8″x8″ pan), or a scratch recipe such asÂ Darla’s Best Brownies. Allow the brownies to fully cool, then cut into small (about 3/4 inch) squares. Whipped Cream- Using 1 cup of cold heavy cream (often labeled heavy whipping cream), whip until it begins to thicken. While mixing, add 1-2 tablespoons of powdered sugar and 1/2 teaspoon of vanilla. Continue to beat until desired consistency is reached. Be carefully not to over-beat. Strawberries- Dice 1 pint of fresh strawberries. Assembly- Layer brownie bites, strawberries and whipped cream in individual dishes. I used small (5 oz) juice glasses. Individual trifle dishes would work great as well. The ingredient quantities above will produce 6 small desserts (with brownie left over). Feel free to adjust the quantities as needed. If desired, Cool Whip may be substituted for the whipped cream. Cover the bread with a warm towel until it’s consumed. Enjoy! Contrary to what the name might suggest, this simple, healthy and wonderfully tasty Syrian dish does not appear to have much Indian influence and is not heavily spiced. Like Damascene cuisine more generally, the key to this dish is its delicately balanced, fresh flavor. It is the ideal dish for breaking one’s fast with friends and family and can easily be cooked in large quantity. Cut onions in narrow slices and dice the tomatoes. Cut the green pepper, eggplant and zucchini into small pieces about 1cm thick. Sweat the onions in a little oil and then add green pepper, eggplant, and zucchini. Add tomatoes, tomato paste and finely chopped mint, salt and pepper. Cook for about 10mins before placing the sauce into a large casserole. Now mix the minced meat with the eggs and breadcrumbs (you can use a little flour instead of breadcrumbs) until you get a firm mass. Season with salt and pepper and roll into small meatballs about the size of a golf ball. Fry the meatballs gently in a little oil (not too long, as they will be cooked for another 30 minutes afterwards). Place the meatballs into the casserole with the sauce and sprinkle with a handful of pine seeds. Place the casserole into a pre-heated oven (200°C) and cook for 30 to 40mins. Serve with rice or flatbread. Start off by blending onion & garlic. Preheat oven to 200ºC. Then, add remaining ingredients (except oil) and blend until desired consistency or until everything is well combined and a fine mix. Taste for spice and seasoning – adjust accordingly. Now, you can make standard falafel (around 8-10) or falafel burgers (4-5). Form into balls, place on baking sheet and press down slightly. Brush with a tiny amount of vegetable oil, and bake for 20-25 mins until hot in middle and crisp. Heat 2-3tbsp oil add the cumin, mustard seeds, fennel seeds, and onion seed and stir. Wait till it pops then add the onion and ginger and stir on high heat for 2 mins. Put heat down to medium and cook for 2 mins. Add asasifeoda, chilli and coriander powder and salt and stir for 2 mins on high heat. Add the cubed potatoes and stir for 3 mins. Add 1/2 cup water and cook on low heat covered for 10 mins or until potato cubes are mushy soft. Mix in the chopped coriander and chillies too with the peas. Leave for another 2 mins on low heat then turn off the heat. Get the flour, oil/ghee and salt in a bowl and then using your finger tips rub the mixture till you get crumb like texture. Gradually add water little bit at a time as you're kneading it into a dough. The dough needs to be firm. Brush water around the flat edge of one Half. Make a cone bringing both ends together slightly overlapping. Press it down to close in the middle. Put the filling in and make a fold on the top flap, bring it over and pinch to close together. heat the oil to a high temperature and then put the samosas into the hot oil. 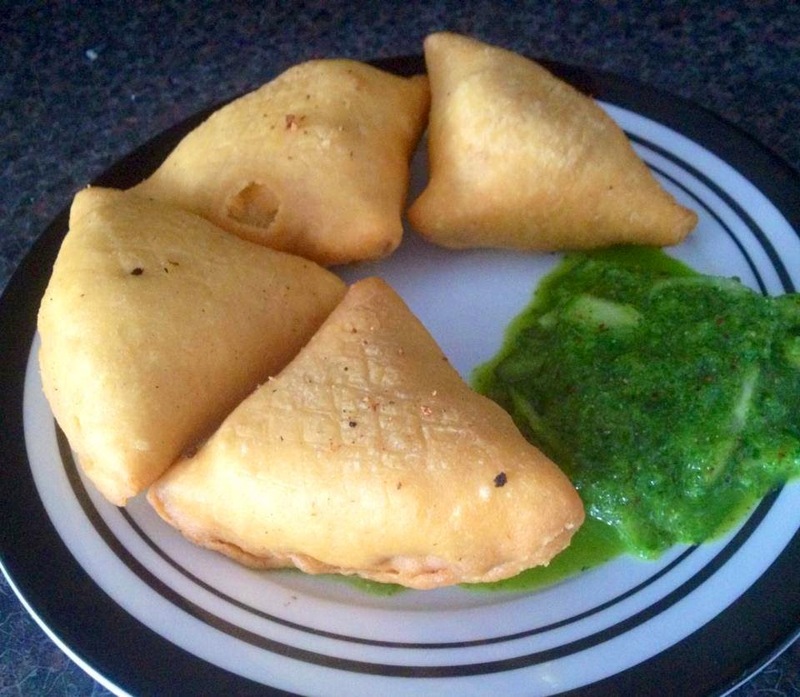 reduce the heat to low after 10 secs and fry the samosa. Cook it till golden and crispy. Take out onto a paper towel to absorb excess oil. Foil and grease a ovenproof tray. 1. In bowl, sprinkle tomatoes with salt. 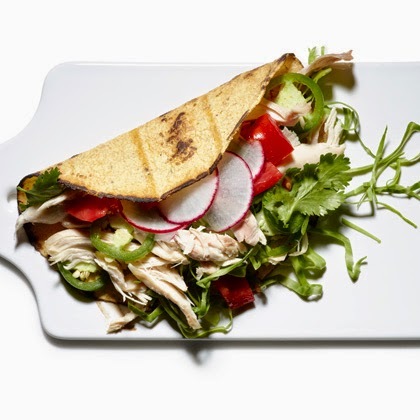 Arrange chicken, radishes, jalapeño, cabbage, and cilantro on platter. Squeeze lime over vegetables. 2. Wrap tortillas in kitchen towel. Microwave 1 minute to heat. 3. Divide fillings among tortillas. • Add 2 to 2 ½ cups of milk + 1 tblsp rose water. • Add 1 tin condensed milk. • When almost done add ½ cup chopped Turkish delight. 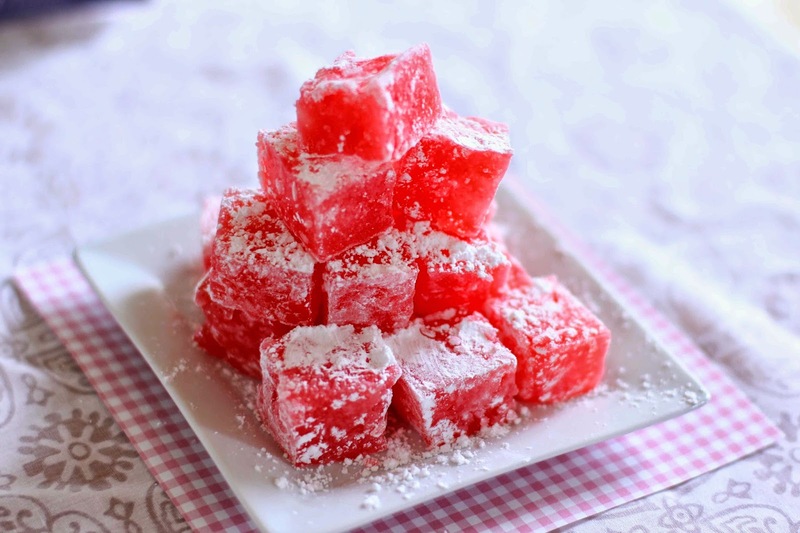 • Decorate with nestle cream and chopped Turkish delight.